But all this joy came for a price - you had to wake up early to get the Patties - otherwise Santosh would run out of them really quickly. Also there was this tiny 6 by 2 feet area in front of the counter full with customers.. as kids - we had an advantage we could sneak in between and get in front of the line pretty quickly. It was not easy to acquire this skill - I took formal training from Neeraj before I could buy Patties on my own.. :-). The Patties are special because they are made fresh completely from scratch in a brick oven right in front of your eyes.. Santosh is still there.. and I will find a way to get pictures of this place to share with everyone..Just an outstanding bakery! 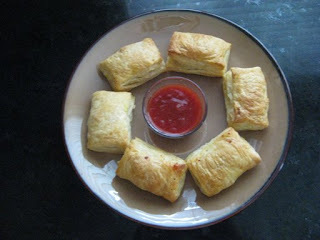 I was thrilled to get to a recipe for the veggie puffs that taste even remotely similar to taste of Santosh Bakery! Take the Pillsbury pastry sheets out of the fridge for defrosting. Mix the spices with the Potatoe pieces (ginger, chillies, salt, red chilly powder, garam masala). Mix well, taste a piece and keep covered for about 10 minutes. Heat the oil in a pan and add hing, turmeric powder and mustard seeds for tadka. Add Potatoes and Mix veggies to the Tadka and saute for a couple of minutes. Cover the pan and keep the heat at slow-medium flame for 3-4 minutes. Turn the heat off - the filling is ready. There are two large sheets in a Pillsbury box. Each sheet makes 6 veggie puffs. Cut the pastry sheet into 6 pieces. Fill one piece at a time and fold the press lightly to close the puff. Put little more than a spoonful of the masala in each puff. Bake for about 15-20 minutes or till the color is golden brown. Enjoy with Chai or Coffee..
Hey Anuja, cute post. Your description of Sunday mornings in India bring back memories...HeMan, Mahabharat and Chanakya...miss those shows! let me know when you post it - I'd be curious about your technique.